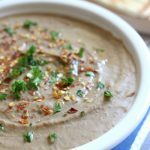 Slow Cooker Lentil Hummus–Make your own garlic lentil hummus at home in your slow cooker. It is super easy to make and a perfect healthy snack. You know what’s super easy? Making your own hummus at home. I love trying different types of hummus. For example instead of using chickpeas I’ll use white beans. In today’s case I used lentils. I love lentils because they have so much nutrition packed into a little pocket of goodness. Plus they don’t need to be soaked and they cook up fairly quickly. I used my slow cooker to cook the lentils which is a perfect hands off way to cook dried beans, legumes and lentils. 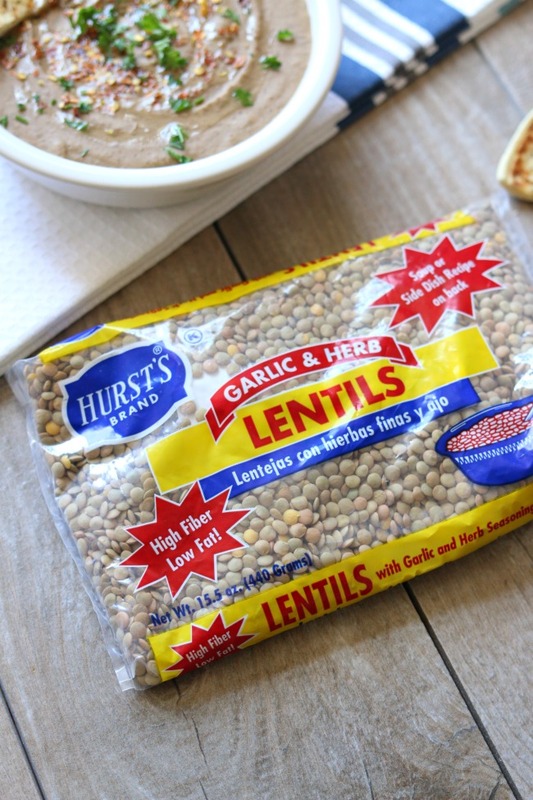 I’m was so excited to use Hurst’s Garlic and Herb Lentils. 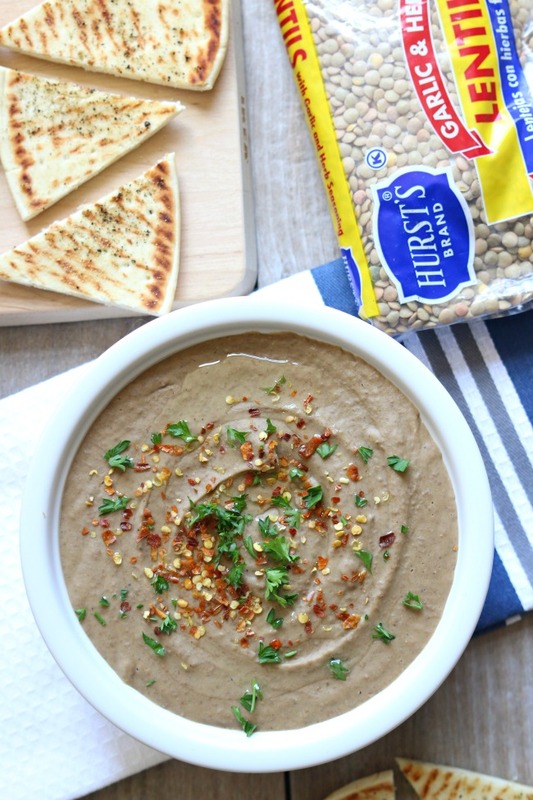 I love using Hurst’s products because their beans and legumes are always so fresh and their seasoning packets are spot on. I’ve made lots of recipes with Hurst’s before. I hope you’ll give some of these other recipes a shot as well. 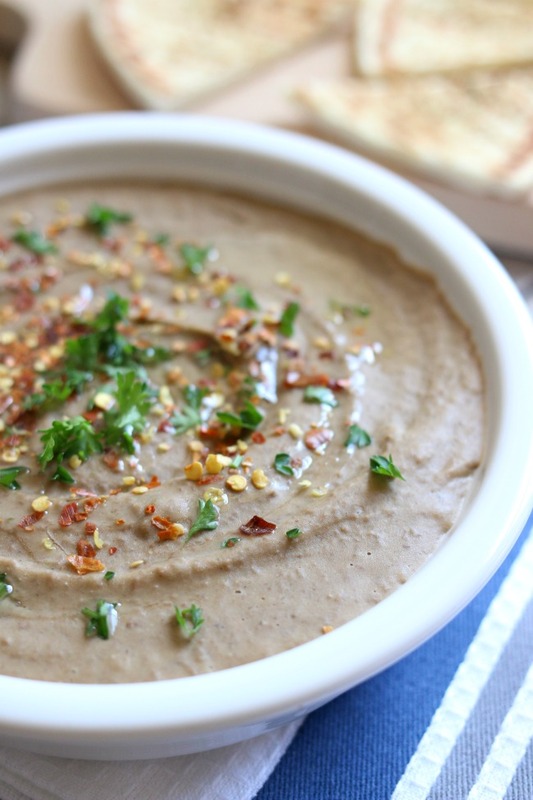 Creamy White Bean and Pinto Bean Soup—this is my favorite recipe! What kind of slow cooker did you use for this recipe? For this recipe I used my little 3-quart Hamilton Beach slow cooker. You could definitely use a larger slow cooker for this recipe as well. I just like to use my 3-quart as much as possible because it’s so much easier to fit into my sink and clean. Guess I need to buy a few more slow cooker liners! Place lentils into the slow cooker. Reserve the seasoning packet for later. Add in the water, salt and garlic cloves. Cover and cook on LOW for 5-6 hours or on HIGH for 2-3 hours, or until lentils are very soft and tender. Place a colander over a bowl. Drain the extra water into the bowl. Save for later. Place lentils into a blender or food processor. Add in oil. Blend until smooth. Add in seasoning packet and a little bit of lemon juice to taste. Salt and pepper to taste. If the hummus is too thick add in some of the reserved liquid and blend (you may even need to add in a bit of extra water). Serve hummus with fresh vegetables or pita chips. Store leftovers in airtight container in the refrigerator for up to a week. Make sure to follow Hurst’s on facebook to see all the new recipes. I love all their soup recipes. I haven’t tried it yet but lentils cook fairly quickly in the instant pot so I think it would work great! Try cooking for 12 minutes on high pressure. WHAT’S IN THE SEASONING PACKET? IN THE EVENT THAT WE DON’T BUY HURST LENTILS, WHAT SEASONING WOULD YOU SUGGEST? I’d use salt and garlic powder or fresh garlic.